Why did the 2009 stimulus package produce such meager results? Partly because the recession turned out to be worse than Obama’s team thought, and partly because they didn’t press for a big enough package even for the recession they thought we had. But another reason is that at the same time the feds were spending more money, state governments were cutting back. The chart below from CBPP tells the story. 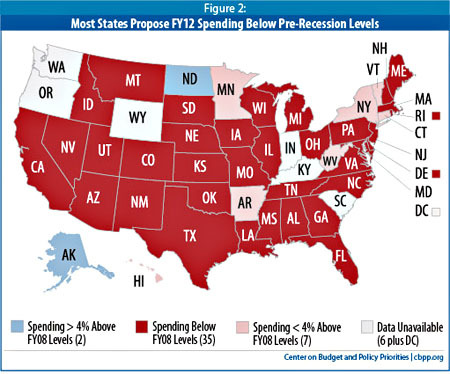 They have data for all but six states, and on average for 2012, “those 44 states plan to spend 9.4 percent less than their states spent before the recession, adjusted for inflation.” That’s not just less than last year, it’s less than 2008. That wiped out nearly the entire effect of the federal stimulus package.